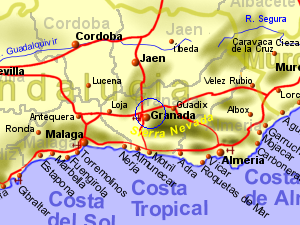 Granada, at a height of 680m and around 50Km from the Mediterranean coast, but with the Sierra Nevada in between. Granada will have cool winter temperatures with a possibility of snow, while the highest point of the Sierra Nevada will have snow for half the year. Summer temperatures can be very good with daily averages similar to the Mediterranean coast but there will be a higher variation between minimum and maximum temperatures.